It is with mixed emotions that we announce the retirement of Dr. Patricia A. Rucker, Senior Vice President, Academic Advancement and Provost today after almost 19 years of dedicated service at Peirce College. During her time at Peirce, Pat served in many roles including, most recently, leading the College’s Academic Division for more than a decade. She has been such a remarkable asset to the College, and we will always be grateful for her leadership, integrity, enthusiasm, and dedication. "My retirement plans include traveling and spending more time with our family who live in Texas and South Carolina. We have five grandchildren with whom we plan to spend a lot more time with. We will continue to live in Center City Philadelphia, where we enjoy the urban life! I am excited for the Peirce community for the future of the College – the new programs at the undergraduate level and the inaugural graduate studies program. There is a talented team of people at Peirce who believe in the mission and vision for the College. Our students benefit from the passion our community has for helping students achieve their academic, career, and personal goals. I want to thank everyone for their support over the years – we accomplished a lot together! I have been surrounded by truly great people who have made it possible for us to achieve so much. I have benefited from the leadership of President Mergiotti. I appreciate his guidance and support and the wisdom he brings to our College. 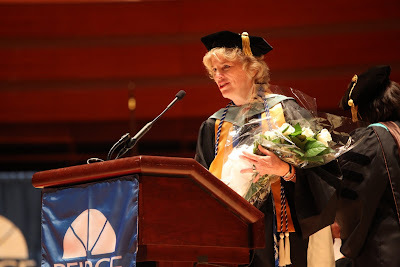 President Mergiotti’s vision and leadership will take Peirce College to great places. While I will not be employed by Peirce, I will always be a friend to the College and will serve as an ambassador wherever I go, every opportunity I have." Thank you Pat, for all you’ve done for the College over the past 19 years. We wish you a wonderful retirement and the best of luck in the years to come. Please stay in touch!